California’s pioneering Pinot Noir winemaker, Merry Edwards, has said that the formation of the Pinot Noir Technical Symposium at Steamboat Inn in Idleyld, Oregon, was the most important factor in improving Pinot Noir in America. This symposium was germinated in 1979 by a chef, a sommelier and a wine salesman from Oregon and a winemaker from California who thought a gathering of Oregon and California Pinot Noir producers would lead to better Pinot Noir. 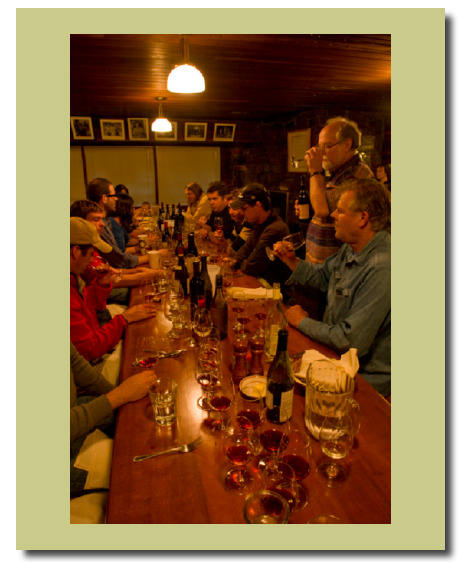 The first symposium was held at Steamboat Inn in 1980 with the goal of Oregonian vintners sharing their knowledge in a convivial and collegial fashion with California vintners. It soon included vintners from Burgundy, Australia, New Zealand, Chile and Canada. After fours without a permanent home for the event, Steamboat Inn was chosen and this fly-fishing retreat along the Umpqua River became the host site ever since. The symposium precedes the International Pinot Noir Celebration that is held annually in McMinnville, Oregon in July. Attendees do some fishing, but it was the blind tastings of unfinished Pinot Noir wines, the discussions that resulted and the camaraderie over dinner and evenings together that led to the Pinot Noir renaissance in America. Many of the current advances in vineyard management, clonal selection, and winemaking were advanced at Steamboat, resulting in a landmark contribution to the remarkable success with Pinot Noir in California and Oregon. No consumers and only very select media (held to confidentiality) were allowed to attend so that press coverage was nonexistent, and the results of the work at the symposium went largely unnoticed except to Pinot Noir producers. Oregonian vintners such as David Adelsheim and Myron Redford as well as California winemaker Michael Richmond played an active role in organizing and directing the goals of the event. Linfield College’s Oregon Wine History Archive offers a 2015 document (“Steamboat Conference History) written by Oregon wine salesman Stephen Cary who was one of the founders of the event: digitalcommons.linfield.edu/owha_cary_docs/1/.